This lodge safari will take you from the bush to the beach in a group of maximum seven travellers. 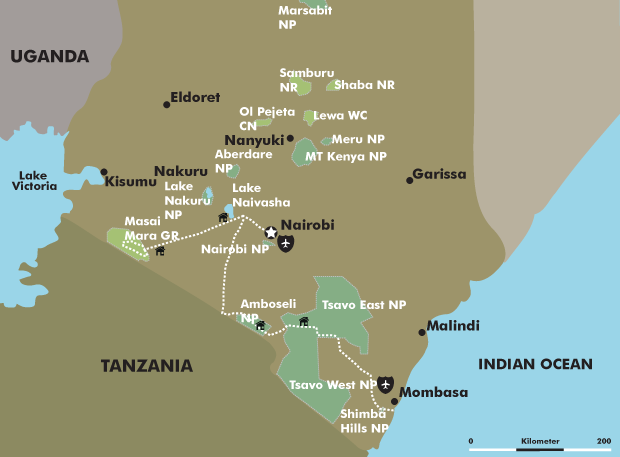 Explore some of the most well-known national parks in the country: in the Masai Mara, at Lake Naivasha, in Amboseli and Tsavo West National Park you will experience Kenya’s stunning landscapes and wildlife from your window-seat in a 4×4 Land Cruiser. After eight days filled with wildlife adventures, you will arrive in Diani Beach, where you can spend a few days relaxing at palm-fringed, sandy, white beaches. Your safari starts with a highlight, taking you straight from the busy city of Nairobi to one of the greatest wildlife destinations on earth: the Masai Mara. After a short briefing about your upcoming safari it is time to head west in your 4×4 Land Cruiser. When city dwellings change into acacias and shrubs, you know you are driving deeper into Masai land. In the afternoon, you embark on your first game drive around the Masai Mara Game Reserve. Look out for lions, elephants, buffaloes, giraffes and many other species you expect to see on a safari. Your safari guide will share many interesting facts about wildlife and the Mara ecosystem. You will be surprised how much you will see and learn on only your first day of your safari. When the shadows grow longer, you will make your way to your home for the next three nights, the Basecamp Masai Mara at the banks of the Talek River. Today, enjoy a whole day of game drives in the magnificent Masai Mara. If you visit the Mara during the Great Migration, stop at the Mara River to witness – with a bit of luck – a river-crossing of wildebeest and zebras, as they swim through the crocodile-infested waters. The Masai Mara is a stunning wildlife destination year-round and any month of the year you can encounter the Big Five and many more. The wind in your hair, take in the vast plains and the breath-taking scenery around you. You will stay another night at the Basecamp Masai Mara, just outside the game reserve. Since animals don’t mind borders, you should look out for wildlife around camp while you enjoy a sundowner before dinner. Another day in the Masai Mara allows you to fully immerse yourself in this wildlife paradise. Taking it slowly you can enjoy the small moments which make a safari a unique experience. Explore different corners of the reserve and get more than just a quick glimpse of the resident wildlife. Together with your guide, you can study the animals’ behaviour and social structures, while looking for rare species. No day in the bush is the same so you can expect another exciting day out and about in nature. You return to the beautiful Basecamp Masai Mara where your time in the Mara comes to an end around the fireplace. Leaving the Masai Mara region behind, you head to Lake Naivasha, Kenya’s flower-capital and one of the few fresh-water lakes in the Great Rift Valley. Arriving at your home for the night on the shores of the lake around lunch time, you can enjoy the afternoon at your own leisure. Book a boat trip on the lake to spot some of the 500 bird species, take a walk across the lodge’s grounds or spend the day by the swimming pool and relax with a good book. It’s time to slow down and take a rest ahead of your next safari experiences. You will stay at the Naivasha Kongoni Lodge. Energised from yesterday’s rest, you head to Amboseli National Park today. Passing the Ngong Mountains on your way, you drive south towards the Tanzanian border where you will find Amboseli, home to large elephant herds. If the weather permits, you will be rewarded for the long drive with a breath-taking view of a lifetime: Tanzania’s Kilimanjaro and its snow-capped Uhuru Peak can be spotted in the distance while elephants walk majestically amongst acacia trees. On your afternoon game drive you may see not only elephants, but with a bit of luck all of the Big Five. Your home for the next two nights is Amboseli Serena Lodge, a great place to continue your safari experience while enjoying views of Kilimanjaro. Today, you will have ample time to explore Amboseli National Park on full-day game drives. While a dry and hot climate dominates the region, Kilimanjaro’s melting snow peaks turn Amboseli into a green oasis in the rainy season. Follow elephant herds and together with your safari guide study their highly developed social behaviour. Along the way, you can spot many more animal species such as cheetahs, wildebeest, zebras and waterbucks. Enjoy the unique moments and take time to appreciate your surroundings. After an exciting day in nature, you will return to Amboseli Serena Lodge for the night. After experiencing some of the most-loved safari destinations in the country in the last few days, there is yet another highlight awaiting you. Tsavo West is one of the largest national parks in the country and place for uncountable opportunities for memorable wildlife encounters. Today, you’ll explore the park on an afternoon game drive. It is well-known for its varied landscapes: in mountains, savannah, thick thorn bushes and forest you can look forward to diverse wildlife and rare species such as Hunter’s hartebeest. Tonight, you will stay at the Severin Safari Camp. By now, you have become a safari expert, having seen diverse landscapes and wildlife sightings and learned many interesting facts from your safari guide. It is time to relax. After adventure-filled days in some of Kenya’s most famous national parks, it is time to dust-off and take it slowly. Today, we take you to Diani Beach on Kenya’s south coast. Driving past the Shimba Hills National Reserve, we take a back-road, avoiding the busy traffic in Mombasa. We pass local villages and green rolling hills, before arriving in Diani Beach, a small beach town with a 13-kilometre uninterrupted tropical coastline, where we will bring you to your beach hotel and say our goodbyes. Relax in the warm Indian Ocean, at one of the many good restaurants and bars and think back on your great Kenyan safari adventures. Contact us for recommendations and bookings of your beach hotel. Please note: If you would like to fly out from Mombasa airport on the last day of your safari, please consult with us before booking your flight.